ST. PAUL, Minn. (Feb. 2, 2018)—University of Minnesota Extension crops educator Brad Carlson was recognized recently with the Minnesota Corn Growers Association’s annual “Friend of Agriculture” award. 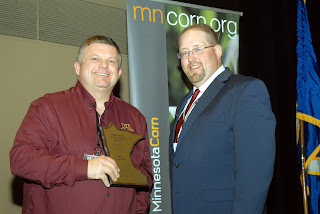 Carlson was honored at the Minnesota Ag Expo in Mankato for his commitment to helping Minnesota farmers build upon their land stewardship while maintaining productive operations. Carlson worked with the corn growers, leading development of the Nitrogen Smart program to elevate environmental care and crop productivity. "Brad's commitment to research-driven programming is reflected in this honor. Nitrogen Smart combines the objectives of high yield and environmental stewardship that are essential to farming," said Jeff Gunsolus, Extension weed scientist and crops program leader. Nitrogen occurs naturally in soil as organic matter, but supplementation of nitrogen fertilizer is necessary for optimizing yield and profit for corn and other crops. In the soil, nitrogen will naturally convert to the nitrate form, which can be lost to surface and ground water causing water quality concerns. Proper management is essential to minimize environmental risk while maintaining profitability. Since its introduction in 2016, Nitrogen Smart has drawn nearly 600 corn farmers to 25 seminars offered throughout Minnesota. Following classes, farmers report they plan to reduce overall nitrogen rates on an annual basis by an estimated 319 tons. The 2018 Nitrogen Smart series begins in February. Carlson is also developing an online curriculum. Carlson is a regional crops educator based in Mankato; he has been with Extension since 1994. More information is available at Extension’s nutrient management programming is available at https://extension.umn.edu/crop-production.